Club Penguin Cheats by Mimo777 Club Penguin Cheats by Mimo777: Club Penguin CFC Reviewed By You! Jkgirl324 said: Since my mom is cathalic and my dad is jewish, I celebrate both Hanukkah and Christmas. For Hanukkah, we light the monorah candles, get presents, and eat matzaballs for dinner. For Christmas, we open up the presents from Santa and my parents in the morning. When thats over, we all eat breakfast and watch the Christmas parade at Disney World in Orlando, Florida. Then we go to my grandma and grandpa's house where we see our whole family, and get more presents!!!!! Later at night, we all have a big feast (all homemade by grandma, the best cook ever) and get to catch up with each other. I love the holidays. I'M SO LUCKY!!!!!!!!!!! WADDLE ON CP!!!!!!!!!!!!!!! YOU ROCK!!!!!!!!!!!!!!!!! Very cool to hear all the different traditions, isn't it? For next weeks review, Club Penguin wants to know which Coins For Change cause did you donate to and why? MIMO its soo cool i just found out that if you playing dance contest on cp and you try to get out of it but the sign(sorry but this room is currently full)shows. if you press the x sign on the map to get back to the game it wont let you play the game any more so all you can do is just stair at the moving arrows till the songs over i think its a glitch but i dont really know...wooo cp and mimo rule wooo yaaa bye. at Christmas around 7 my brother wakes me up and we both go to my parents room and we all watch TV until around 8 then me and my brother go down stairs and sit near the presents but my mum says we cant open any of our presents till everyone is down in the living room but that's soo unfair coz my dad spends ages upstairs just to annoy me and my brother..cp rocks go mimo yaaa!!!!! I like the first review! It's true, here in AUS we just have a BBQ and salad, instead of having turkey just like most Americans do. Iv'e never even had a turkey. And the weird thing is that it is Summer here when it is Winter everwhere else over the globe. where do u write the reviews?? My school did the basket thing, but some lowlifes didn't understand that people needed this, so they stole all the presents and money from the baskets. We're trying to figure out something different. Mimo: Candy-cane wingwarmers are now showing. Work Hard to Beat Them! Sorry about this being totally unrelated, just didnt know where else to post it. Does not need to be published, only if you want it to be. Whoever did that was evil and wicked and should be punished appropriately. I hope you guys figure out something else! Good Luck! Hey Mimo, could you choose a server and have a stamp party? 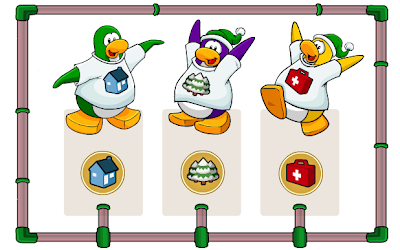 I REALLY want the party host stamp but can't get people to my igloo. PLEASE! Me and my cousin help my grandma make tamales and other good food. We also help her setup before the christmas party. We sleep at her house the day before tthe party to help her setup and stuff. We also get antsy waiting for our parents to bring the presents. Hey, Anonymous! To make a review, go to the Community Blog's post, then go down to the comments and write down your review in a comment! P.S. I'm modding from my cousin's iPad! Go on the 'what's new' page and you comment on the reviewed by you post. ---------------------------------------------------------------I live in england but i have turkey my parent well my dad sells them and we have the biggest turkey. mimo do you have turkey on christmas day if you do please respond i whould like to know. mimo you know the advert for roblox you have on your site i go on it.